Lymph has a composition comparable to that of blood plasma, but it may differ slightly. Lymph contains white blood cells. In particular the lymph that leaves a lymph node is richer in lymphocytes. 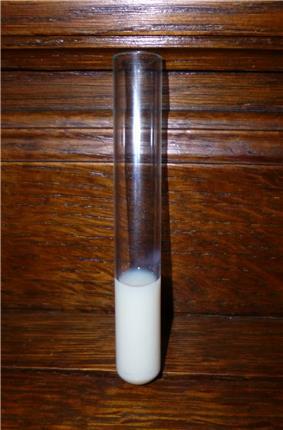 Likewise, the lymph formed in the human digestive system called chyle is rich in triglycerides (fat), and looks milky white. Blood supplies nutrients and important metabolites to the cells of a tissue and collects back the waste products they produce, which requires exchange of respective constituents between the blood and tissue cells. However, this exchange is not direct but instead is effected through an intermediary called interstitial fluid or tissue fluid that the blood forms. Interstitial fluid is the fluid that occupies the spaces between the cells and constitutes their immediate environment. As the blood and the surrounding cells continually add and remove substances from the interstitial fluid, its composition continually changes. 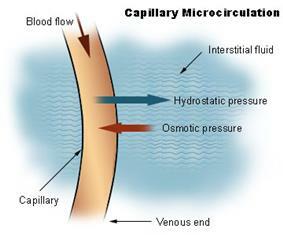 Water and solutes can pass between the interstitial fluid and blood via diffusion across gaps in capillary walls called intercellular clefts; thus, the blood and interstitial fluid are in dynamic equilibrium with each other. 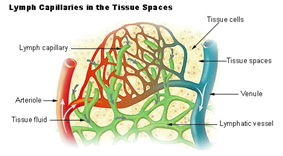 Unlike the cardiovascular system, the lymphatic system is not closed and has no central pump, or lymph hearts. Lymph transport, therefore, is slow and sporadic. Despite low pressure, lymph movement occurs due to peristalsis (propulsion of the lymph due to alternate contraction and relaxation of smooth muscle), valves, and compression during contraction of adjacent skeletal muscle and arterial pulsation. Lymph that enters the lymph vessels from the interstitial space usually does not flow backwards along the vessels because of the presence of valves. If excessive hydrostatic pressure develops within the lymph vessels, though, some fluid can leak back into the interstitial space and contribute to formation of oedema. ^ Warwick, Roger; Peter L. Williams (1973) . "Angiology (Chapter 6)". Gray's anatomy. illustrated by Richard E. M. Moore (Thirty-fifth ed.). London: Longman. pp. 588–785. ^ Sloop, Charles H.; Ladislav Dory; Paul S. Roheim (March 1987). "Interstitial fluid lipoproteins" (PDF). Journal of Lipid Research 28 (3): 225–237. ^ Shayan, Ramin; Achen, Marc G.; Stacker, Steven A. (2006). "Lymphatic vessels in cancer metastasis: bridging the gaps". Carcinogenesis 27 (9): 1729–38.